Below the vast blue mirror of Ventana Bay lives a variety of flora and fauna, what the locals call “silvestre” or the “wild”. At the core of this diverse ecosystem are the rocky coral reefs that dot our beautiful coast line. While our predominantly finger-based coral may not provide as colorful a display as seen in coral colonies throughout the Caribbean, these shallow, rock-based reefs provide a critical habitat for a diverse array of life that have called Ventana Bay “home” long before we did. 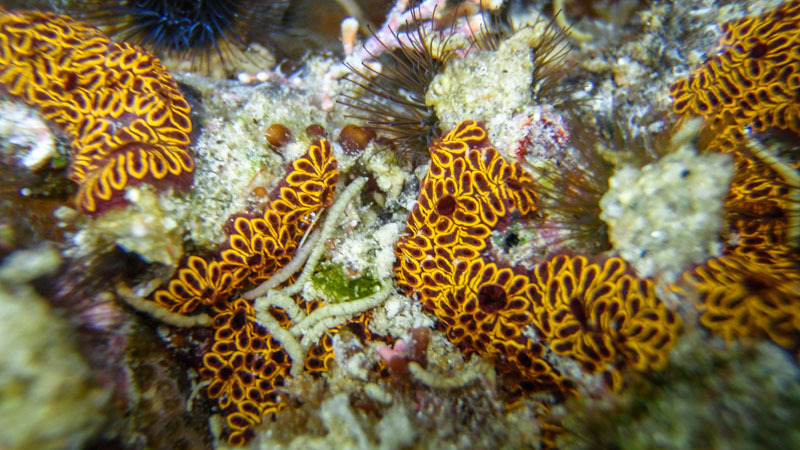 Ventana Bay marine life depends on the health of the local rocky coral reef systems for habitat, reproduction, and nourishment. 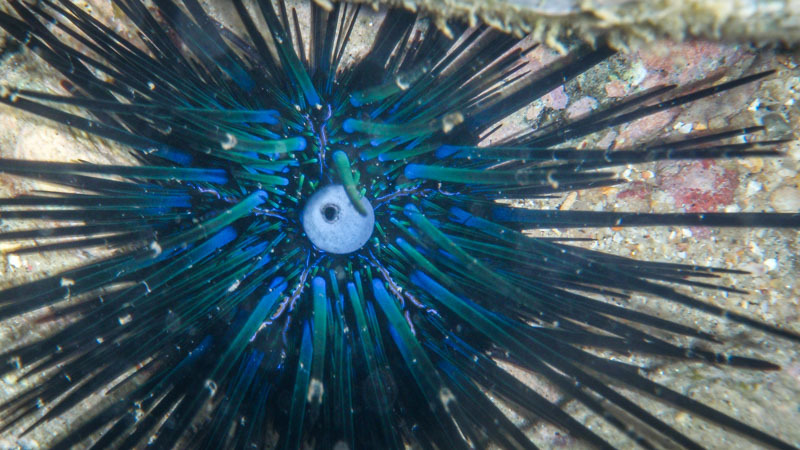 Generally found in the shallow waters from the beach to a depth of 25-30 feet, reef colonies around La Ventana Bay grow best close to the surface of the sea as they depend on sunlight to flourish. But it takes more than sunshine for the coral to thrive. Many of the reef dwellers actually help their living habitat to grow and prosper, having a mutually beneficial or “symbiotic” relationship with their habitat. Exotic-looking fish like the parrot fish are now well-known to be instrumental in cleaning the coral, then digesting and excreting nutrients for coral health. 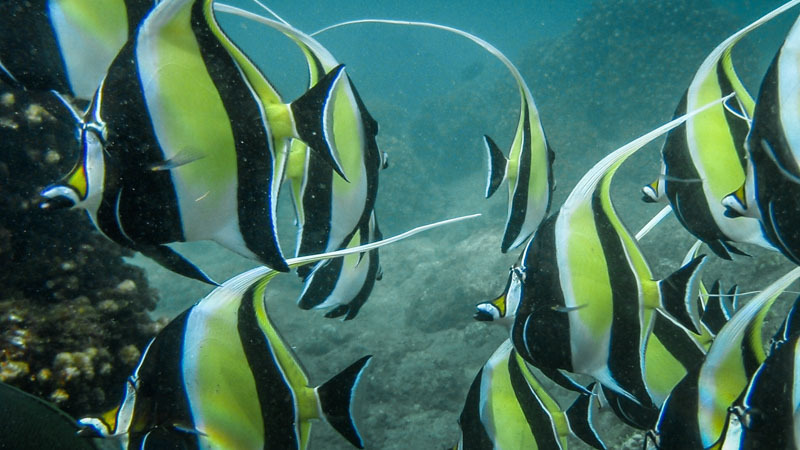 Some less eye-catching reef fish, such as Trigger fish, Chub fish, and Mexican Hogfish, also play a key role for coral development and regeneration. 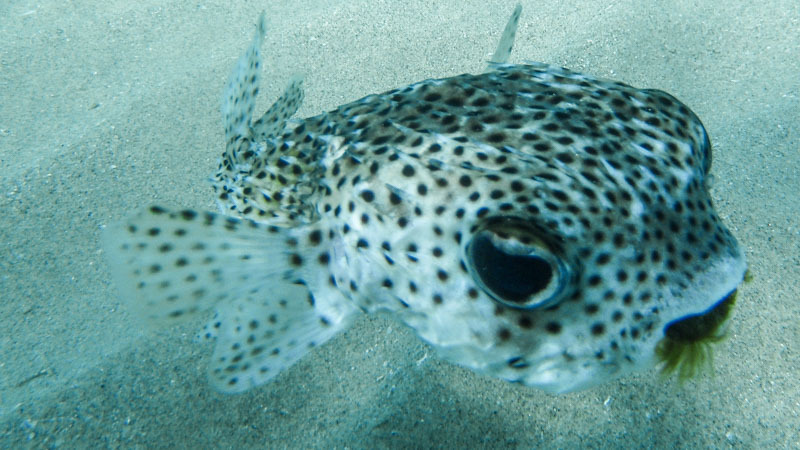 Even the abundant Sergeant Major fish greatly contribute to a reef’s expansion. In the unpredictable waters of the Sea of California, coral reef systems live and die. Storm waters flush nutrients from the arroyo run-off. Algae blooms can suffocate entire ecosystems in a matter of months. 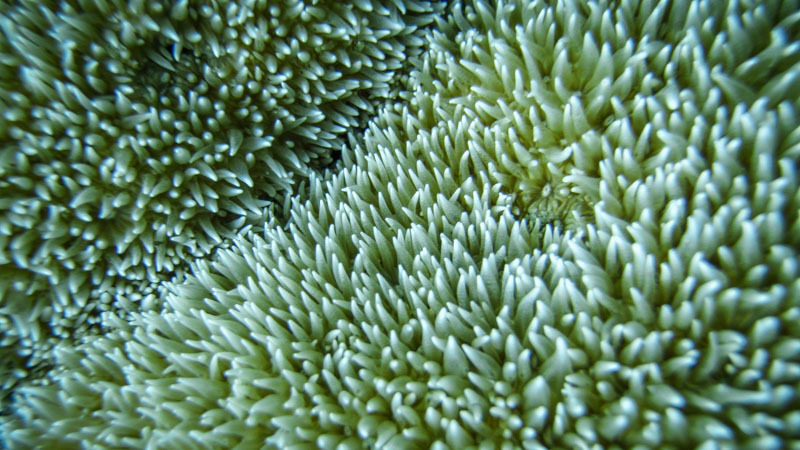 When it is too cold or too hot there is coral bleaching. During the late summer season when Hurricanes are common, the corals are actively seeding and locals believe that these strong winds redistribute coral seedlings, bringing to life new reefs along the rocky coast. Unlike pelagic fish that live in the deep blue sea, reef fish live in a hyper-competitive, sensitive ecosystem. While some varieties of reef fish spawn thousands, even millions, of eggs to increase their chance of successful reproduction, chances of survival within the first year of life is slim – less than one percent in many species. To add to the struggles of reef dwellers, reef proximity to human populations exacerbate the vulnerability of these ecosystems with overfishing, pollution, sedimentation, and habitat lost to development. So how can we as humans help and have a more symbiotic relationship with our fish “vecinos”? Coming together as a growing community, we CAN help to provide solace to our underwater sanctuaries. The first step to environmental protection is educating others on how they can help. For example, if you are a kiter briefing visitors on local kite launch locations and conditions, please let them know: WE ARE NOT ALONE! When we launch, land, splash and crash into the crystal blue waters of Ventana Bay, we may be disturbing others that call these waters their home. 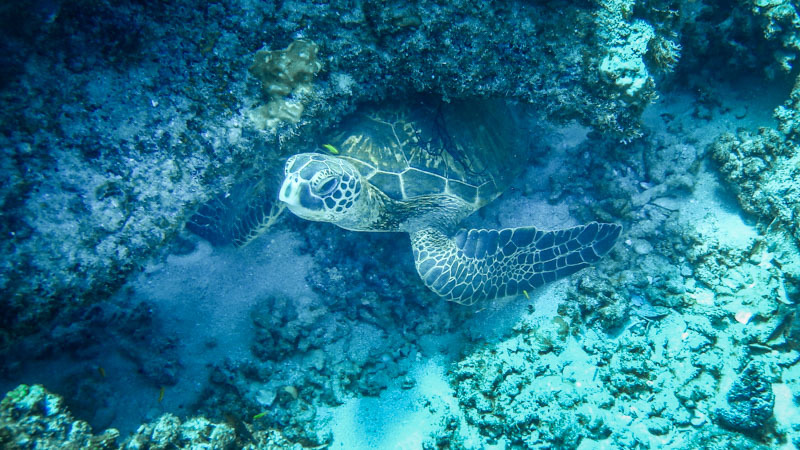 Encourage them to sail over to green waters (which are over sand bottoms) or deep blue (deep enough not to affect bottom dwellers), and limit activity over the shallow reefs. No matter what water sports or beach activities you enjoy, let’s all work together and create awareness of the hidden, fragile ecosystems that live along our rocky coast — in some areas within feet of the water’s surface. Have fun away from the shallow reefs, for your own safety and for the silent inhabitants of our beautiful bay.